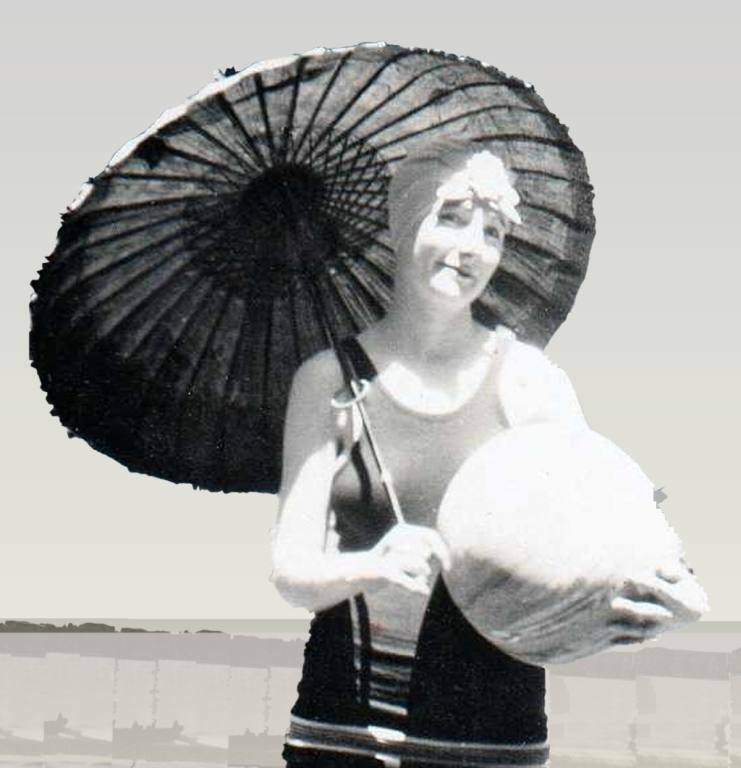 Changes in fashion don't always match changes in decades. The fashions I remember as quintessentially "sixties" didn't dominate until after 1964, and many fifties styles continued into the early 1960s. Hem length is a good indicator. 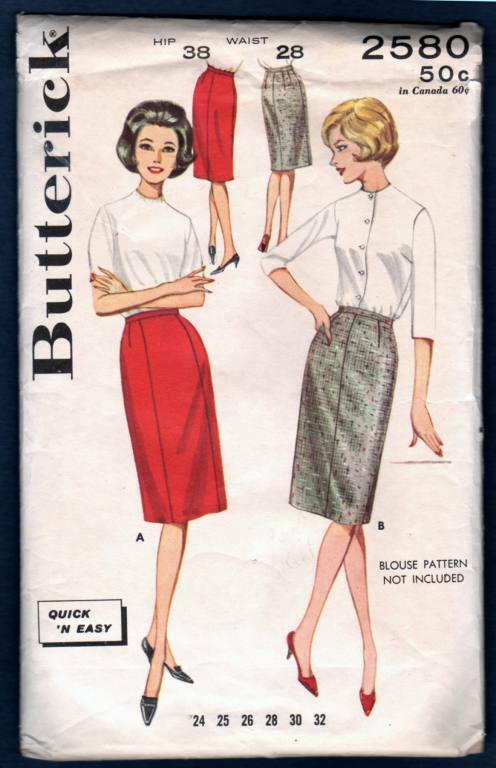 This Butterick pattern (#2580) appeared between 1962 and 1965, but it's definitely not a miniskirt. (In the early 60s, we still wore stockings held up with garters. Wearing a miniskirt required pantyhose instead.) This knee length skirt reminds me that, at my Catholic high school in 1962, girls were tested for too-short skirts by being made to kneel on the floor. If your skirt didn't touch the floor, you could be sent home. To enlarge any image, click on it and then select the full screen option. Simplicity #2311 is dated 1957 on the instruction sheet. The 50s skirts are much longer, but the tops have many features still seen in the early sixties: 3/4 sleeves, a bias cut "boatneck" collar, and belt over a loose fitting jacket. 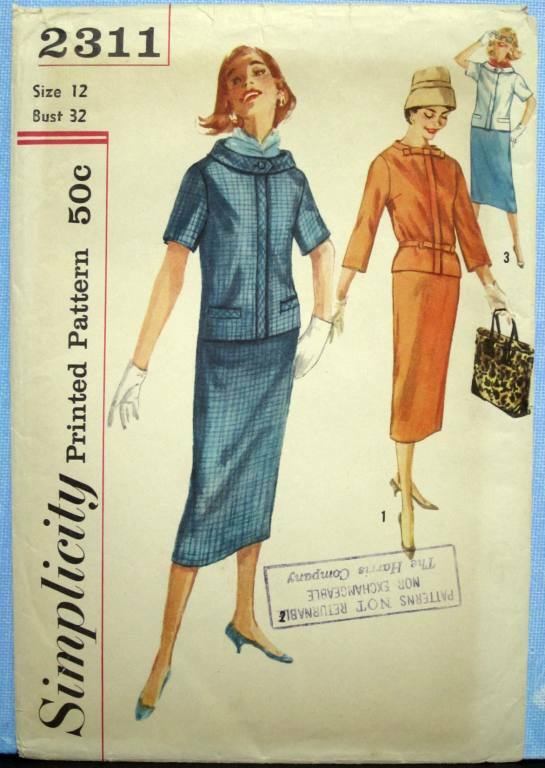 Many Vogue patterns featured in Elegance magazines from 1964 & '65 have these same features, combined with knee-length (not mini length) skirts. McCall's #9319 is dated 1968. This is the skirt length often associated with the sixties, but it was not a mainstream, adult fashion until the late sixties. It was hard to buy a dress long enough to wear to work -- I was a high school teacher, 5' 7" tall, and always worried about the rear view when I reached up to write on the chalkboard in the early 70s. In 1972, I still routinely put a false hem in every dress I bought, in order to add an inch and a half to the hem length. This "sixties" mini look did not end until the mid- 70s.